Popular reality show Bigg Boss 11, is soon going to witness its Weekend Ka Vaar episode in which the host of show Salman Khan will take class of the mischievious contestant of the house. In this weekend episode too, he will be seen taking a stand for what is right and will punish whoever is wrong. In this week, there was one such contestant who got a lot of backlash from the public for his insensitive comments. What happened was, during a conversation between Luv Tyagi, Priyank Sharma and Hina Khan, everyone was being discussed. It happened before Bigg Boss introduced the captaincy task. Hina whose named got changed, said, “Akash ne mera vote nikal diya or Humne Akash ko promise kiya tha use vote krenge.” After which Priyank shouted out and said that everyone was playing a dirty game and because of Shilpa Shinde, who can't even run, a deserving candidate ie. Hina Khan had to suffer. After his comments tried to stop him but Hina did not said a word to him. Priyank who was furiated, further said, “Arey bhai voh aurat bhaag bhi nai sakti, sand jaisi bodies hain unki. Weight itna gain kr liya hai unhone.” Luv again tried to stopped him but Priyank said that it is the truth. Salman, in the Weekend Ka Vaar episode will be seen talking about the same and calls him in the witness box during the conversation. Salman tried to ask him his mother's weight that made everyone go curious as Arshi, Vikas, Shilpa, Bandgi and Puneesh were not present during the conversation. 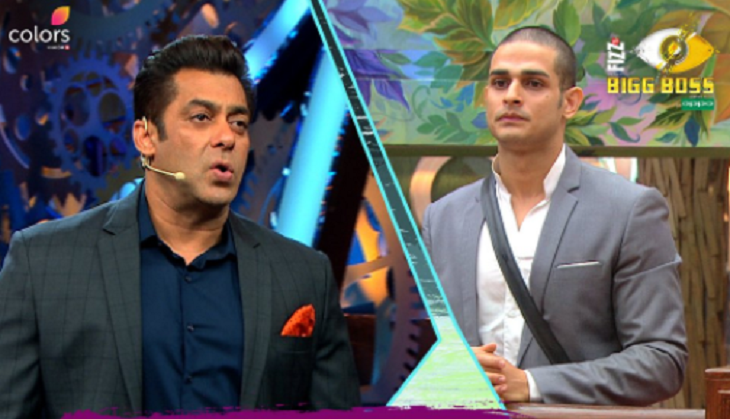 Salman later revealed that Priyank had said such things about Arshi and Shilpa which made everyone angry. Vikas, who was also present at the moment, said that Priyank has been saying all such things because no one is stopping him from do. Not only this, Salman also targeted Hina Khan for supporting Priyank in body-shaming. For more details related to Bigg Boss 11, stay tuned!